Caption Giant pride parade from the Embarcadero to Civic Center with many participants in costume. 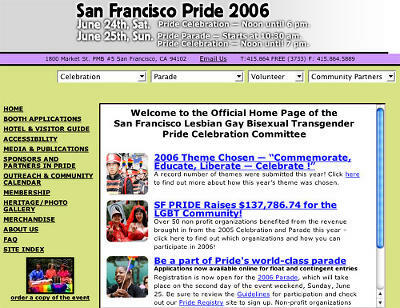 2006 Theme Chosen — “Commemorate Educate Liberate — Celebrate !” June 24 Sat: Pride Celebration Noon to 6pm. June 25 Sun: Parade at 10:30. Celebration noon to 7pm. Headline Last weekend JUNE: San Francisco shows its pride.